EcoBoost four-cylinder packs more power, but the base Mustang also gets bigger brakes and better aero. 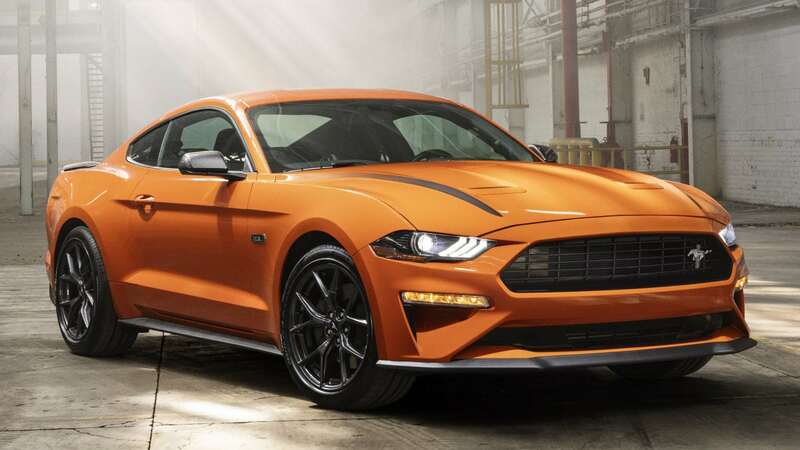 The big news for the 2020 Ford Mustang is the long-awaited introduction of the new Shelby GT500 with more than 700 horsepower, but the Motor Company is also adding some performance on the other end of the lineup. The base model EcoBoost Mustang will be available with the 2.3L High Performance Package for 2020, lifting the power output of the turbocharged four-cylinder engine, broadening the peak torque band and adding some performance parts from the Mustang GT to create a pony car built specifically to rule the autocross scene. The key aspect of the 2.3L High Performance Package is – as you might expect – the four-cylinder EcoBoost engine of the base model Mustang. This package begins with a die-cast alloy engine block and high performance cylinder head that are similar to the setup on the Focus RS, adding 63-millimeter twin-scroll turbo compressor that is 5% bigger than the “snail” on the basic EcoBoost Mustang. These features lead to 330 horsepower and 350 lb-ft of torque, along with offering a wider powerband that improves every area of acceleration. Ford expects the Mustang with the EcoBoost High Performance Package to dash from a stop to 60 in the mid-four-second range while hitting a top speed of 155 miles per hour. In other words, this extra power makes the base Mustang quicker on the short end, stronger in the mid-range and faster on the big end. This package is available with either the 6-speed manual or 10-speed automatic transmission and as either a coupe or convertible. Pricing will be announced closer to dealer launch, which is scheduled for this fall. Ford wanted the 2.3L High Performance Package to be more than just a bump in power, so the team added an array of performance bits from the V8-powered Mustang GT. This includes the four-piston brake calipers over 13.9-inch rotors up front, a 32-millimeter solid front sway bar, a tubular 24-inch rear sway bar, a unique tune for the electronic steering system, special calibrations for the drive modes, a 3.55 rear differential, package-specific 19x9-inch wheels and GT aero bits, including the front splitter, the belly pan and brake cooling ramps. Finally, base Mustang buyers who opt for the 2.3L High Performance Package can add the new EcoBoost Handling Package. This adds semi-metallic brake pads, a Torsen 3.55 limited slip differential, specially calibrated MagneRide dampers, a solid rear sway bar, 19x9.5-inch wheels and 265/40/19 Pirelli P Zero Corsa4 tires. This package is only available on the coupe.